What Flowers Grow in Mexico? Mexico encompasses a staggering range of environments, from the vast expanse of the arid Sonoran desert to the snow-topped mountains in the Sierra Madre Oriental and Sierra Madre Occidenta mountain ranges. The diversity of its topography allows for a magical assortment of native plants and animals that have evolved to fit every aspect of Mexico's varied country. Many Mexican flowers are grown throughout the world, cherished for their unique blooms. The Dahlia genus, which contains more than 30 species of flowering tuberous perennials, has a long history in Mexico. The plant, which is native to Mexico, Central American and Colombia, was used for ceremonial and decorative purposes by the ancient Aztecs. The Dahlia is the national flower of Mexico, and it's easy to see why. 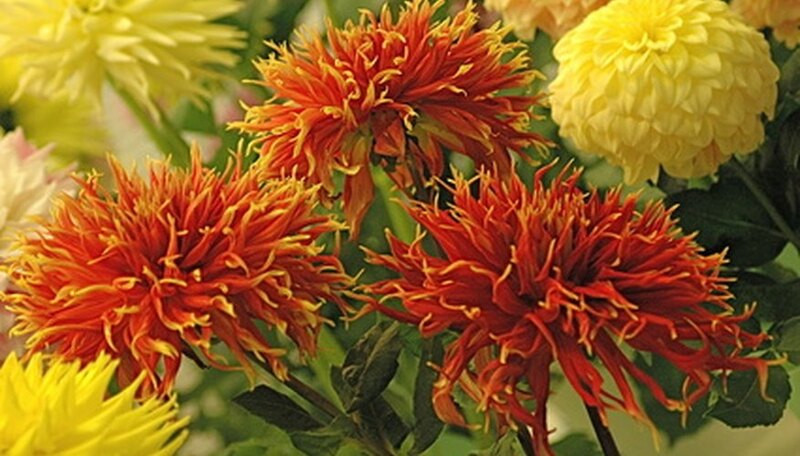 Dahlias come in brilliant colors, with dense layers of petals. Some Dahlia species grow to be 1 foot high, others up to 8 feet high. Varieties include the deep burgundy colored Dahlia Aurora's Kiss and the delicate pink and yellow Dahlia Adelaide Fontane. Dahlias produce their best flowers if they have very well-drained soil and full sunlight. Mexipedium xerophyticum (no common name) is an extremely rare orchid that is native only to Oaxaca, Mexico. Cultivated only for ornamental purposes, this orchid has silvery green leaves and delicate small flowers that are white with accents of pale pink. The orchid is framed by two petals that curve outward like an upside down crescent moon. The Mexipedium xerophyticum grows directly on cliffs and in rocky crevasses, preferring dry conditions. Mexipedium xerophyticum require filtered or indirect sunlight to thrive. Gentian sage (Salvia patens) is a herbaceous perennial that grows throughout Central Mexico. The plant is frequently cultivated for its ornamental blooms, which are a brilliant shade of blue. Though Gentian sage is a perennial in its native habitat, the plant usually is grown as an annual because it has such a low-frost tolerance. Gentian sage thrives in well-drained soils in full sun, and the plant produces its famous flowers in the summer and the fall. What Flowers Are Native to Mexico?